When she purchased a rundown property overlooking the Bay of Cannes in France, she discovered on the grounds sixty-eight, 400-year-old olive trees. 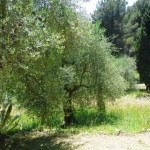 Once the land was reclaimed and the olives pressed, Carol along with her French husband, Michel, became the producers of top-quality olive oil. Her series of memoirs, love stories, recounting her experiences on her farm (The Olive Farm, The Olive Season, The Olive Harvest and Return to the Olive Farm) have become international bestsellers. Carol's fascination with the olive tree extended to a seventeenth-month, solo Mediterranean journey in search of the tree's mythical secrets. The resulting travel books, The Olive Route and The Olive Tree, have inspired a five-part documentary films series entitled The Olive Route. Carol has also been invited to work with UNESCO to help create an Olive Heritage Trail around the Mediterranean with the dual goals of creating peace in the region and honouring the ancient heritage of the olive tree. 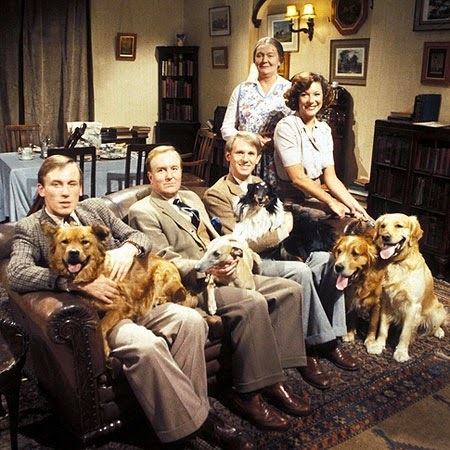 Q: Carol, the series and the books of All Creatures Great and Small are a cultural phenomenon - I’ve just discovered there is a James Herriot World (link: http://www.worldofjamesherriot.org/) What do you think is its enduring appeal? Do you still hear from fans? A: I constantly hear from fans, particularly from the US and Germany. It might be that the programmes seem to run and run in those two countries. The good news is that when these viewers visit my website, to find out what I am doing now, a high percentage of them begin to buy and read my books and then join my Facebook page and then – wham – they have become a part of my more recent life. The World of James Herriot is, I think, linked to the museum in Thirsk. The building was his surgery and several years ago became a museum of his life and books and, of course, the television series. Its enduring appeal is based on several ingredients, I think. The good humour in the material and, very importantly, Alf Wight’s genuine affection for man and beast. His ‘narrator’s voice’ is a very positive one; he draws you into his world and the optimism of it. The series was exceedingly well cast – every single minor role added to the whole – and much care was taken over the period details. It was historically accurate. Q: You’ve worked with some remarkable directors and actors – Olivier at the National and Kubrick in ‘A Clockwork Orange’. How do you feel your career as an actress has fed your work as an author? A: I think the training I received at Drama Centre London, now part of UAL, University of the Arts London, was exceptional in that it was a hands-on training for actors and directors, offering movement and mime classes, use of costume, approaching texts, of course, but as well, it gave a literary education. We began with the Greeks and worked our way through history from Shakespeare to Pinter, Edward Bond, O’Casey, Beckett... It included Brecht, Calderon, Lorca and many of the European classical playwrights. I also learned the business of HARD work. We began at 8.45am and frequently did not finish till nine at night. Later, if we were performing or working backstage on plays. I learned that commitment is the first principle. Without that, little is achieved. I had always dreamed of being a writer although I always knew I would be an actress. The theatre, the world of entertainment, was in my blood and is a strong part of my family background on my father’s side. Writing was not. It meant that I held the art of writing in a more scared place. I have been writing since I was about seven, but it was at drama school that I began to understand form – what creating drama involves - and the inner life of characters. Obviously, when I left drama school I had to be open to other ways of approaching a play, a text, and broaden my approach. Working on ACGS was also a great lesson in both writing and directing. As always on film sets, a great deal of the actors’ time is spent hanging around waiting to shoot. I used that time fruitfully. I watched and I learnt, as I had done with Olivier. I watched to see what worked and what didn’t. The pace of a scene, the inner strengths of it, the emotional content: what to contain and what to expose. All of it marvellous fodder for the Carol yet-to-be, the professional writer. I have been very privileged. A brief word about Stanley Kubrick. Every member of his team, every technician, said that Stanley was the only director they had worked with who could do their job better than they could. He knew filmmaking inside out and every technician held him in great esteem for that. He was also a very considerate man. It was my very first job out of drama school. I had two lines and he gave me the time and attention due to one who had already earned their stripes in the profession. I am honoured to have worked with him and even during that brief time of employment, I came away with rich lessons learned. Q: You’ve published twenty books for both the adult and young adult markets, and your latest title is ‘The Only Girl in the World’, a Young Adult novel. What was the inspiration for this story? A: I had spent a fair amount of time researching WWII for a book set in the south of France but I got stuck and I put the material aside, wondering what to do next. It was one of those fortunate moments. Scholastic provided the answer. Jill Sawyer, my editor, offered me the opportunity to write a book set at any point in history I wanted, as long as it was a love story. Given that this is the centenary of the outbreak of WWI and my head was still full of thoughts of war, I immediately suggested a story set in 1916 in France, in the Somme region. I drove north to Arras and spent time in and around the Somme valley visiting the cemeteries and talking to local families. I was very moved by all that I discovered and the landscape is evocative and very beautiful. I was hooked! Q: The first books I read of yours were from the wonderful series inspired by the olive farm near Cannes that you’ve brought back to life. The Olive Farm, The Olive Season, The Olive Harvest and Return to the Olive Farm have become international bestsellers. I remember reading them during a snowy, chilly winter in Cheshire and being transported to the colour and heat of the South of France. Your love for the region shines through your books – is this a part of the world you always dreamt of living in? A: Not at all. I thought I would end up in Italy. In fact, I did live there for a short while in my twenties. I was in Rome. I loved it but for various reasons that chapter of my life ended and I returned to London and went on to shoot ACGS and from that was offered work internationally. It was during a film shoot in Australia when I was taken out to dinner by the executive producer, a Frenchman called Michel, that my life quite literally changed overnight. He asked me to marry him on that very first date. The rest is history and a bestselling collection of books. In fact, next 10th April is our twenty-fifth wedding anniversary. The inspiration for the books is threefold: the love Michel and I have built together, the amazing ruin that revealed itself to be an olive farm with sixty-eight, four-hundred-year-old olive trees growing on its terraces as well as the passion I have found for the olive tree itself, its history and traditions existing all around the Mediterranean. It is an endless source of amazement and joy to me. Q: Thinking of your fiction, like the recent number 1 ‘The Girl in Room Fourteen’, your ‘voice’ carries over, particularly the way you conjure the sensual beauty of the Mediterranean. But I wonder if it’s a case of putting on different ‘hats’ to write your historical novels and the Olive Farm series? Do you prefer writing fiction, or crafting books based on real life? A: I see no difference between them, except to say that when I am writing ‘non-fiction’, particularly historical fiction, I need to be exacting in my research and contain my story within the bounds of the reality and period I have chosen for myself. I don’t write - or haven’t yet! – historical biography. The characters in my historical stories are invented. So, I can choose them to be as I want, except they must behave within the parameters of the society and time they live in. For example, in The Only Girl in the World, Dennis, the young English soldier who falls in love with a French girl living in the Somme valley, does not attempt to persuade Hélène into bed with him. She is a Catholic girl living in a French village in 1916. She doesn’t stand out in the street smoking or going to clubs with friends, and he is an inexperienced young lad from London. They both need to behave as people from their time, not as a couple might behave today. In fact, I think it adds spice to the tenderness of their story that they so rarely touch each other and throughout the book they only kiss once when he is going to the Front. I enjoy telling stories. The genre is not the point. Also, I love nature in all its tiniest details and I think that is carried over into all my work. Landscape, territory, flora, fauna, these marvellous gifts of life find their way into my work. 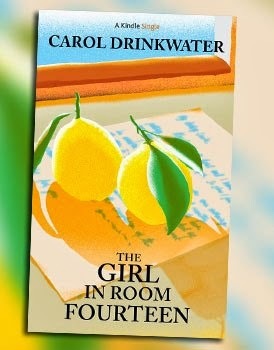 The Girl in Room Fourteen is a fictional tale of a woman living about five miles from where we are here at the olive farm. The difference is that she, Cécile, grows and sells lemons while she waits for the man she loves to return to her. It is a fictional tale but the natural beauty of the Mediterranean plays a starring role in the piece. Q: I understand that you made a seventeen-month, solo Mediterranean journey in search of the olive tree's mythical secrets? (The resulting travel books, The Olive Route and The Olive Tree, have inspired a five-part documentary films series entitled The Olive Route). What were your favourite moments, and what did you learn on this journey? A: It is very hard to highlight single moments because the entire experience was exceptional. Lonely, challenging, occasionally frightening, yes; always exciting, often touching and endlessly wondrous. Spending time in war zones and discovering at grassroots level the generosity of man towards man was life-affirming. I was held up at gunpoint in Israel as I passed through Rachel’s Crossing checkpoint out of Bethlehem. I was caught in Al-Qaeda bombings in Algiers ... I shared meals with Berber women in the desert ... I have made many, many friends and talked to some of the oldest trees on earth. Q: UNESCO has invited you to help create an Olive Heritage Trail around the Mediterranean with the goals of creating peace in the region and honouring the ancient heritage of the olive tree. Will this also be a chance to highlight your interests in ecology – I’m thinking particularly of your work with bees? A: UNESCO gave their name in support of the making of the films once they had read my two books and they helped open many doors for us. I have attended meetings with some of their scientific experts in the hope of identifying an Olive Heritage Trail around the Med, but the economic difficulties that UNESCO is facing added to certain in-house political disagreements have meant that this project is moving very slowly. I think they count on our work and the films to dig the roots! It has nothing to do with my fight for the plight of the honeybee, and other pollinating creatures. My OLIVEFARM Facebook page, though, seems to have attracted beekeepers worldwide and that is very exciting. A beekeeper from Georgia signed up this week. I feel all this might lead somewhere positive. Q: Can you tell us a little about your daily routine as a writer? With all your travelling, are there any rituals you have to focus on writing wherever you are? Do you prefer silence, or music? A: Silence, absolutely silence, or natural sounds from nature. And candles. I light candles when I am writing whatever time of day or night. I am a morning writer and like to achieve six hours. I will work longer when I am deeply into a book and particularly if I have a deadline looming. I work in my little library but obviously as I travel a great deal I have to make myself makeshift ‘dens’ wherever I am. Q: The writing life can be quite solitary – do you find combining film and TV work with your life as an author brings balance? A: Definitely, yes, although I am not really acting anymore. I am very sad about this and miss it deeply but that seems to be the way it has worked out and I have so much in my life that to complain would be churlish. I work on documentaries with my husband recording the narration and working on the texts. And, of course, literary events are a great excuse for me to take the stage! Q: Which novelists and artists (or actors, film-makers etc), do you most admire? Are there particular works (books, films, plays) you return to again and again? A: The list is SO long. I re-read Graham Greene regularly although I haven’t done so for a couple of years. 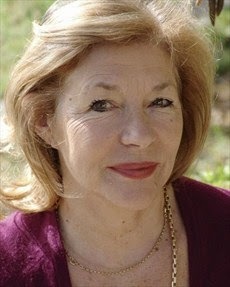 I am inspired by Isabel Allende, particularly the early works. Marguerite Duras is my heroine because I so admire the rawness of her writing and the fact that she directed back when there were few female directors working in cinema. Doris Lessing, Edna O’Brien, and many more. Actresses? Gena Rowlands, Anna Magnani, Sophia Loren... Directors? Preston Sturgess, Pedro Amoldovar, Ingmar Bergman, John Cassavetes.. we could be here all night! Q: In this wonderfully rich creative life of books, film and acting, what are you most proud of? A: None of it! I love my life but the moment I have finished a project and I have shed its skin, I move on. I have never seen ACGS, for example. Odd clips or episodes, nothing more. I try not to hold on to my material – fearfully difficult in some ways. I always think ‘if only I had done this or that’.., so it is best not to give it another thought. Q: If you could travel back in time to meet the young girl who grew up between Ireland and England, and pass on a piece of advice, what would it be? What have you learnt from your research into history, your personal journey so far? A: GET ON WITH IT, stop procrastinating and worrying whether you are any good or not. DO IT! (and I am still saying it). The Only Girl in the World is published in April by Scholastic. The moving WW1 romance tells the story of a young British soldier, Dennis, and his experiences of war on the Western Front. During his leave, he meets and falls in love with a local girl Helene, and promises he will return for her when the war is over. The book wonderfully evokes both the trauma of battle, and every day life in provincial France, and is a genuinely moving account of love and loss. I found myself rooting for ‘Denniz’ as Helene calls him, and desperately hoping he would make it home to her. It is a real achievement to get that depth of feeling within the constraints of a YA novel, and from the horror of war to craft a story that ends with hope for the future. 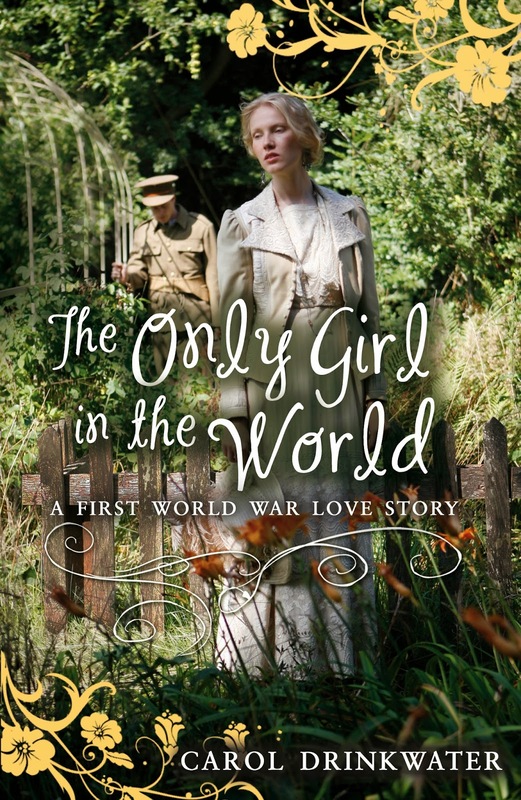 Look out for the chance to win one of five copies of ‘The Only Girl in the World’ in this month’s competition on The History Girls on 31st March. I enjoyed this post very much! I had a 30-year acting career before becoming a full-time writer, and I can relate to much of what Carol says. More books to order - great!